Having read what Romney said, I think Amanda Marcotte and the Emily's List graphic get the issue right. Mitt Romney's 'binders full of women' comment was "amusingly daft", and not anything terrible. The binder stuff isn't a hard-hitting takedown of Romney, it's just gleeful liberals having fun and creating silly tumblrs after a good night. That is what happy people do on the internet. The problem, though, is that the most substantial achievement Romney could boast of is that he did a good and conscientious job of giving women cabinet positions as governor of Massachusetts. It's nice that he did that, but unless Romney creates millions of new Cabinet positions and equitably hires women to them, his personal virtue will not solve the widespread social problems here. Pay inequity calls for a public policy solution. 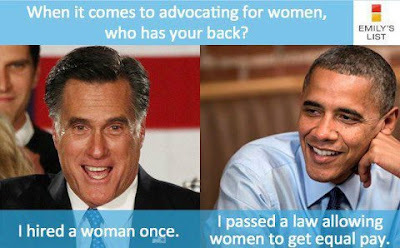 Through the Lilly Ledbetter Act and insurance that covers women's medical needs, that's what Obama has been delivering. My reaction in real time to this was that it dovetailed perfectly with Paul Ryan's attempt to paint Mitt as compassionate because of his individual acts of charity. That's nice, but at the end of the day it's policy that matters, not one man's choices. I think Romney should discuss exactly how he plans to help small businesses. He could certainly highlight incentives that will be given to the private sector for companies that offer business loans for small business owners.